I am soooo good this month. My August group gift is ready one day early! Yay! One of my Second Life KittyCats, Confetti Cake, has a habit of sitting still as a statue, looking out the living room window, peeking through the stalks of pampas grass at the fish in our pond. Her midnight black fur and pink collar, and the stalks of grass in the background inspired me to make the Wannabe Cat + Pseudo Rose flower arrangement. This entry was posted in Freebies and Gifts on July 31, 2011 by moriko. What do Apricot Yummatini, Bluey Granatini, Cherry Orangini, Kawaii Melontini and Strawberry Limonati have in common? They are the yummy cocktails that are part of the brand new Candylane Collection released by -Hanaya- Yummy Collectibles which is available at our in-world store, as well as the SL Marketplace. With a focus on animated outdoor activities, eating and drinking, the collection is perfect for summertime entertaining. Available as a complete fun value pack, or as smaller sets, it celebrates summery fun times with your friends and family at the beach, on your patio or in your garden. We’ve also bundled in our Cupcake War hunt gift – the Canvas Beach Chair Suntan set – for those of you that missed getting it. The Candylane Outdoor Munch’n’Drink Furniture Set has been lovingly designed, sculpted and textured in our workshop to give you a product with 100% attention to every small detail. The chairs include 4 adjustable quality animations (no poseballs) and give you an icy glass of water with ice cubes. On the funky table is a tray with 5 summery cocktails and a bowl of luscious fruit, which dispense fruit and drinks (drinks include a slow sipping animation). A sunshade tops the table, and comes in two versions – daytime and night-time with blinky candy and star party lights. To get out of that wet bikini or bathing suit, you need a place to change! Our Candylane Beach & Pool Change Hut allows you to do that in yummy style. Two unisex animations let you get prettied up in this yummy canvas hut. 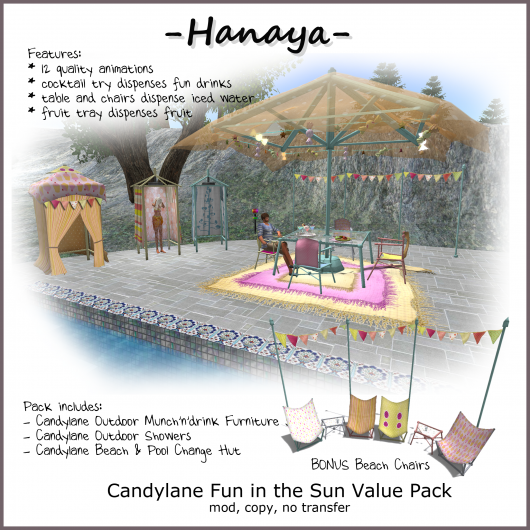 All items in the -Hanaya- Candylane Collection are available at our in-world store (pop by and check them out while they are rezzed), and on the Second Life Marketplace for you home shoppers. This entry was posted in Product Announcements on July 18, 2011 by moriko. I have been feeling very candy-ish (read sparkly, pink, yummy and sweet) lately. My new creations always reflect my mood, so the -Hanaya- Candylane collection was born. 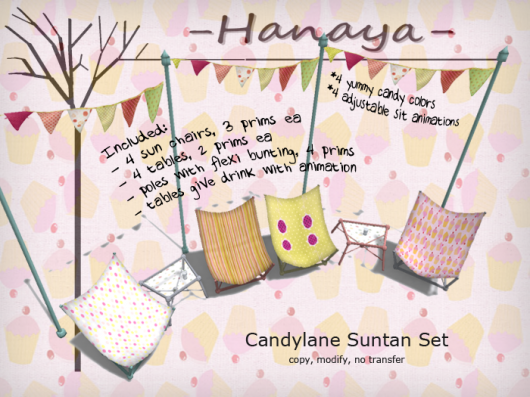 The first release in the collection, the -Hanaya- Candylane Suntan Set, will be gifted to girls and boys who participate in the Cupcake War Hunt, which starts on July 15th. The set includes four yummy canvas chairs with four animations (2 girlie ones and 2 unisex), four yummy little side tables that dispense icy sparkly glasses of water with ice cubes to all your guests, and a festive summery bunting in a bunch of different sizes to fit almost any location. 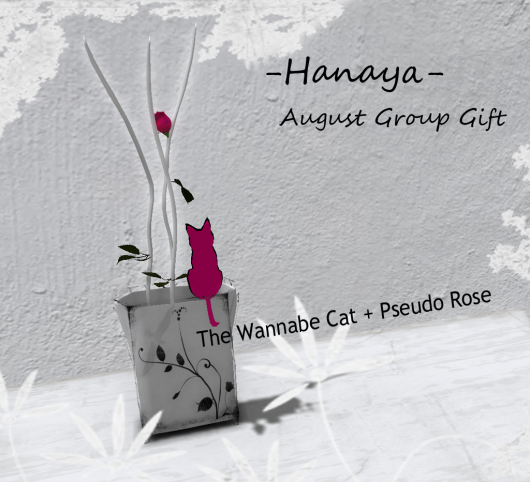 So come get yours during the Cupcake War Hunt at our in-world store, and hook into our Flickr, subscribo or in-world group for news on new matching pieces in the -Hanaya- Candylane collection. This entry was posted in Events, Freebies and Gifts on July 14, 2011 by moriko. 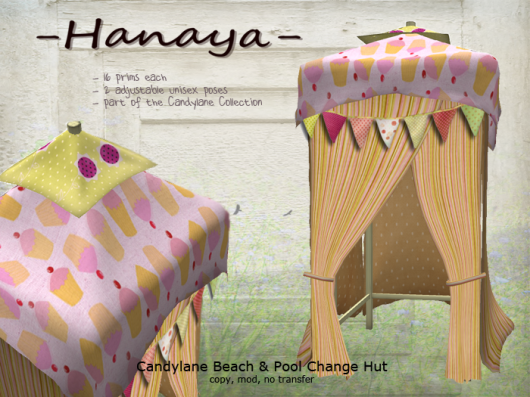 A brand new release from -Hanaya- Yummy Collectibles, the Vintage Chaise Lounge Set (Texture Change) is now available for purchase at our main store, at our branch store in the tower at Vintage Village in Verdigris, and on the Second Life Marketplace. The set, which includes many limited edition textures, consists of a chaise lounge, a matching round table with a Tiffany lamp and a window with built in drapes, shutters and windowbox with ivy. More than 50 vintage textures are grouped into 3 coordinated looks – Merlot, Sage and Provence. The look of a by-gone era is echoed in the crocheted afghan throw, the antique Tiffany lamp, and in the materials used for the draperies, bedding and table cloth. Meticulous details such as the custom sculpted windowbox, edging on the afghan and tassels add to the special feel of this vintage set, which is also available in single theme colours (without texture change) pictured below. The Provence colour theme’s blues and yellows, with antique lace inset drapes have a bright and cheerful look. The model is shown in the ‘Sit’ animation. Green tones dominate the Sage colour theme – the image shows the model in the ‘Lounge’ animation. The Merlot colour theme, with it’s soothing pinks and mauves is accented with teal. The model is in the ‘Read’ animation, which rezzes an old-fashioned opened book as the animation is activated. The complete texture change set is currently rezzed out in the new furniture releases area of our main store, directly at the landing point so you can try out the set’s texture change menu and animations. This entry was posted in Product Announcements on July 12, 2011 by moriko. This entry was posted in Freebies and Gifts, Product Announcements on July 1, 2011 by moriko.